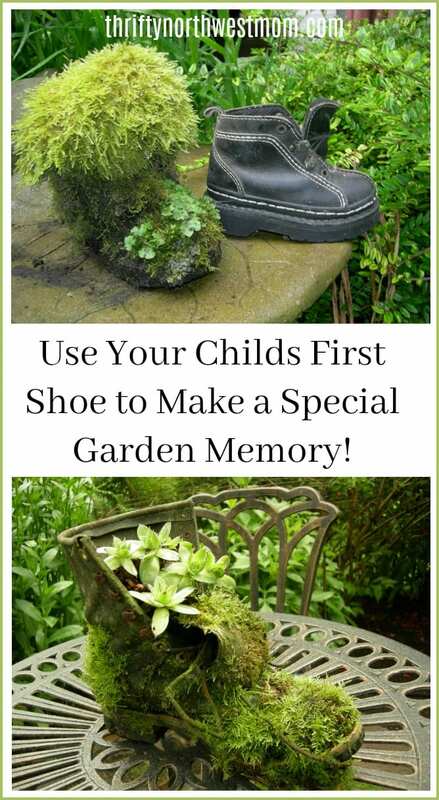 Recycling Shoes to Make New Garden Art & Preserve Special Memories! 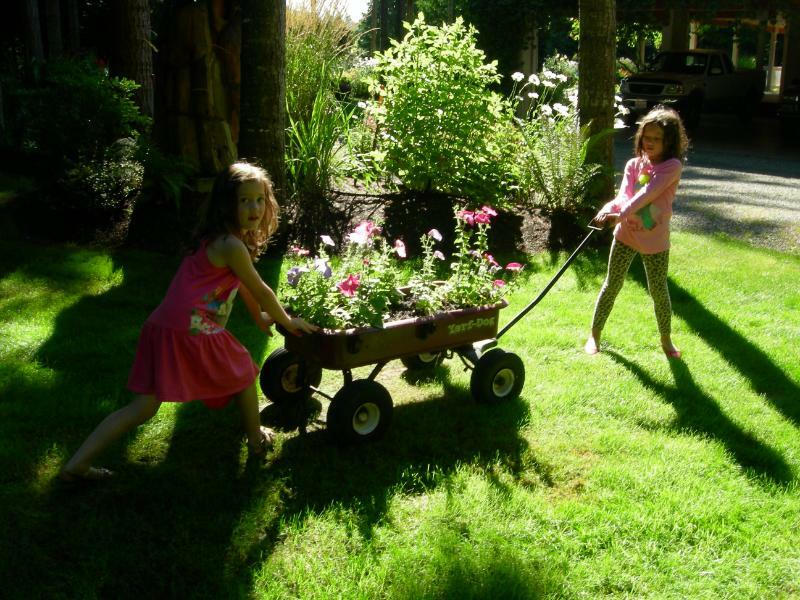 Here is a fun project for your garden, that is very frugal, and will help you preserve memories too. Create garden art with old shoes. Its a great way to create a showpiece in your garden that has special meaning to you. Use a pair of shoes your child wore or a pair that have some other special meaning for you. My mom has created these from many of her grandchildren’s shoes (a memorable pair from when they were little – boots work best). She also made one from a pair of her old work boots when she retired. Not only are they fun talking pieces, they always lead us down memory lane as we walk through the garden and come across specific shoes. They are really simple to make, and can be very affordable if you buy plants that are not too expensive. A shoe you are no longer using. Simply fill your boot with dirt, and add your plant. 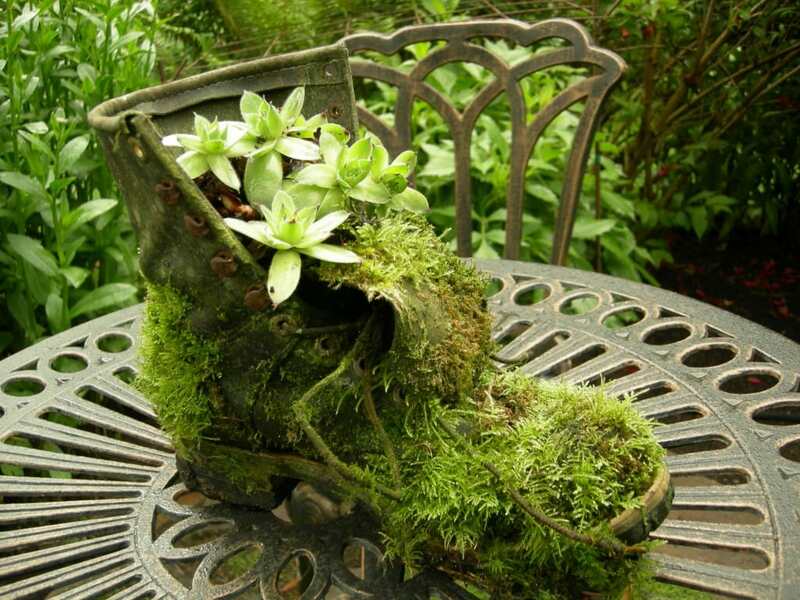 If you let it sit out side it will ‘grow’ a more weathered look over time (the moss on the boot above is courtesy of nature!). 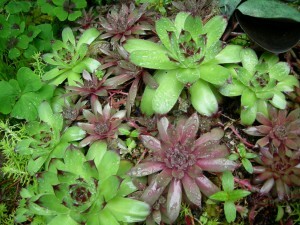 We used chicks and hens because they are a hardy plant that does not require too much maintenance, and they can add great color contrast for the boots (greens and purples mostly). If you are not familiar with chicks and hens you can find them at most garden stores (including Home Depot and Fred Meyer). They are pretty affordable and have a texture I love (look kind of like a cactus plant in my opinion). They do not require a strong green thumb, so just ask about tips on how to care for them when you are in your local garden store. Another plus is that they don’t require a ton of watering, which is great for the boot when it acts as a planter initially. You could use any plant you choose to grow though, as you are simply using the boot as a garden container. 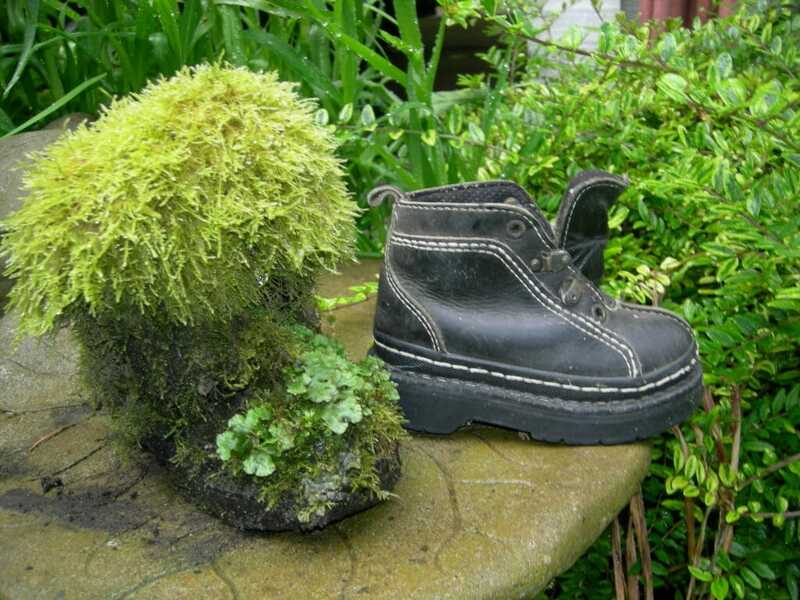 We even used just some simple moss (perfect in the NW), for a boot I saved from when my son was a toddler! One of my favorite things about this kind of garden art, is that your garden starts to become a living story. My mom was a truck driver when we were growing up and the boot pictured at the top of the page is one of her work boots. The photo directly above was one of my sons boots when he was just a toddler, and it is a precious memory for us. I can still see him walking around with his special little strut in them. Walking through the garden and seeing these pieces trigger many memories for me, and make garden walks that much nicer! 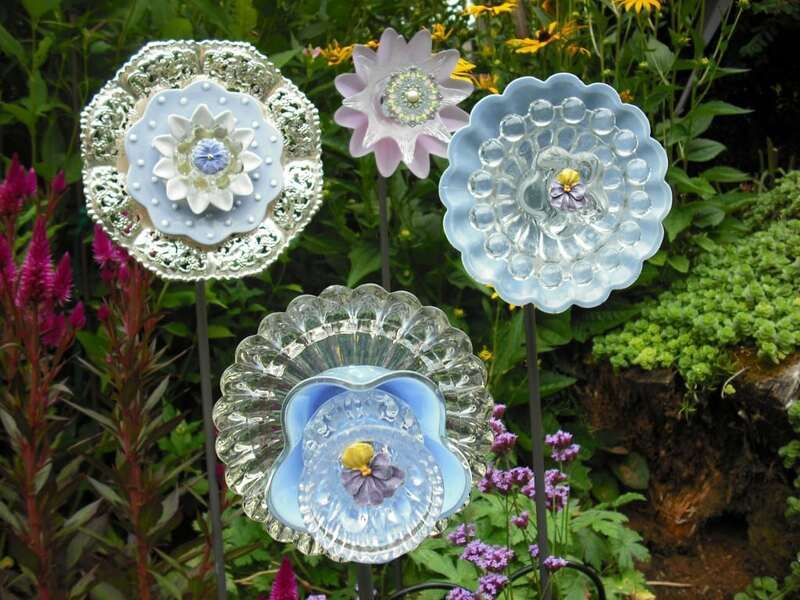 Make glass flowers out of upcycled dishes! 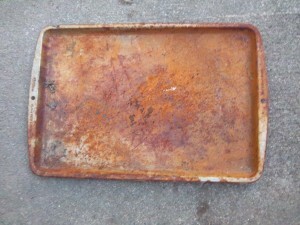 Turn this rusty old tray, into this…. Recycle items you are tossing out as garden signs. I pulled a rusty tray out of the trash (thank you kids for leaving this one out in the rain), and used a $.97 can of black spray paint from Home Depot for a base coat. 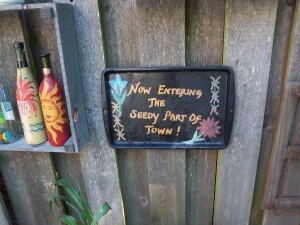 “Now entering the seedy part of town” – it just fit my family….what can I say! Finally, I used the kids art supplies to paint the quote and a few decorations, and spray with a sealer (I had a clear coat of spray paint on hand – you can pick this up at Home Depot too). As you can see I am no artist, but after a little weathered patina (happens naturally when you leave it outside), it fits in perfect for us. Reuse wine bottles as vases or candle holders. 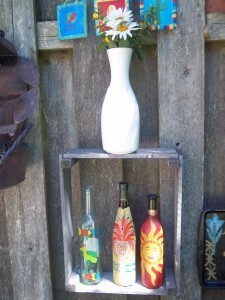 I often use old wine bottles as a canvas to get creative with. They would head to the recycle bin anyway, so no loss if you don’t get it perfect. I just add a little color and then you use it as a vase by adding single flowers, or get the thin pillar candles and use them as a candle holder.